Calling PH suppliers! Join the Passive House pavilion at Buildex Vancouver – there are only a few booth spaces remaining! The Passive House Canada Pavilion at Buildex Vancouver is THE place to visit for high performance building products. Stand out as a provider of Passive House suitable products in our branded showcase of the latest products and services and connect with 14,000 construction professionals from the Greater Vancouver Region. To secure your booth contact Gaby at gabriela@passivehousecanada.com before December 5th. To register for these seminars, visit the Buildex website. VANCOUVER, BC. October 29, 2018 – From November 5 – 9 at the Vancouver Convention Centre (East and West), the United Nations Economic Commission for Europe’s Committee on Forests and the Forest Industry (COFFI) (which includes North America), the Canadian Wood Council/Wood WORKS! BC, and Passive House Canada are collaborating on a week of events to drive forward solutions for the transformation of the global building sector. As the need to take climate action becomes an imminent global issue, more innovative steps are being taken to manage renewable resources and the development of high-performance buildings. 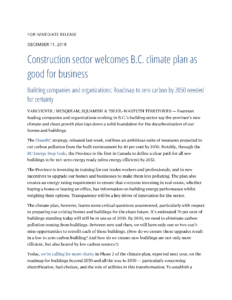 In Canada, policy initiatives such as the BC Energy Step Code and Build Smart – Canada’s National Building Strategy have moved to the front stage and become a guide post for the transformation of buildings in municipalities across Canada. During the week of November 5th, more than 600 international policy makers, subject matter experts, industry professionals and government officials will gather to provide solutions, identify partnerships and build collaborative efforts to help transition towards a sustainable building sector and low-carbon economy based on the provision of sustainably managed forests, and the development of high-performance/net-zero ready buildings. The three conferences will be addressing the benefits of placing renewable resources (forests) and high-performance buildings at the centre of a sustainable future. Themed “Inspired by wood in the 21st century: Redefining how the world builds”, the Wood WORKS! BC 2018 Wood Solutions Conference will inform building and design professionals about the latest innovations and expertise in the use of wood products and building systems through seminars, an interactive trade show and engagement opportunities. With an exceptional line-up of speakers from across Canada and around the world, as well as design and building innovators, product experts and key members of project teams, this conference is the premier annual wood learning event in BC. Under the title ‘Building the Future with Forests’, the UNECE Committee on Forests and the Forest Industry will bring an important message to the world: the Vancouver Invitation on Forest Products for a Better Future. This message will garner champions to create a larger community of stakeholders who see the value of forest products as a key element of the green economy and the achievement of the Sustainable Development Goals (SDGs). “The Government of Canada understands the benefits that forest products play in meeting climate targets, creating good jobs, stimulating economic growth and building more resilient communities. As the world embraces new clean, renewable energy, wood – from sustainably managed forests – is poised to play an increasingly important role. This is why we are making strategic investments now – in areas such as tall wood construction and the emerging bio economy – to ensure Canada remains a global forestry leader well into the future,” concluded the Honourable Amarjeet Sohi, Canada’s Minister of Natural Resources. Passive House Canada (PHC) is a national non-profit professional association advocating for the Passive House high-performance building standard. Passive House Canada is Canada’s leading educational provider for the Passive House building standard. PHC facilitates the adoption of the Passive House Standard through advocacy work, a national education program, and nation-wide events. The Canadian Wood Council (CWC) is the national association representing manufacturers of Canadian wood products used in construction – enabling the selling of Canadian wood products through programs and services focused on creating market access and demand. Wood WORKS! is a program of the Canadian Wood Council, with a goal to support innovation and advance the use of wood in building and design. The UNECE Committee on Forests and the Forest Industries (COFFI) is a principal subsidiary body of the UNECE (United Nations Economic Commission for Europe) based in Geneva. It constitutes a forum for cooperation and consultation between member countries on forests, the forest industry and forest product matters. All countries of Europe, the Commonwealth of Independent States, the United States of America, Canada and Israel are members of the UNECE and participate in its work. The joint UNECE/FAO Forestry and Timber Section provides the Secretariat to the UNECE COFFI and the FAO European Forestry Commission, and works to implement the UNECE/FAO Integrated Programme of Work (IPoW). Thank you for your interest in the 2018 Passive House Canada Annual General Meeting agenda. You can access the agenda in the link provided below. Thank you for showing your interest in the 2017 Annual General Meeting minutes. You can access the meeting minutes in full at the link provided below.